Kate’s Miracle SPINAL INSERTION MACHINE. Line up to the left, please, and have your ride token ready for collection. Ever wish, as a shopkeeper, that you could get a spine, and stop feeling bad when people tromp all over you and then expect you to feel happy about it? That you could stop apologizing for running your business in a way that allows your business to exist? Well, Kate to the rescue. Here’s a nice sign that’ll keep you smiling through the toughest situations in your consignment, resale, or thrift shop. 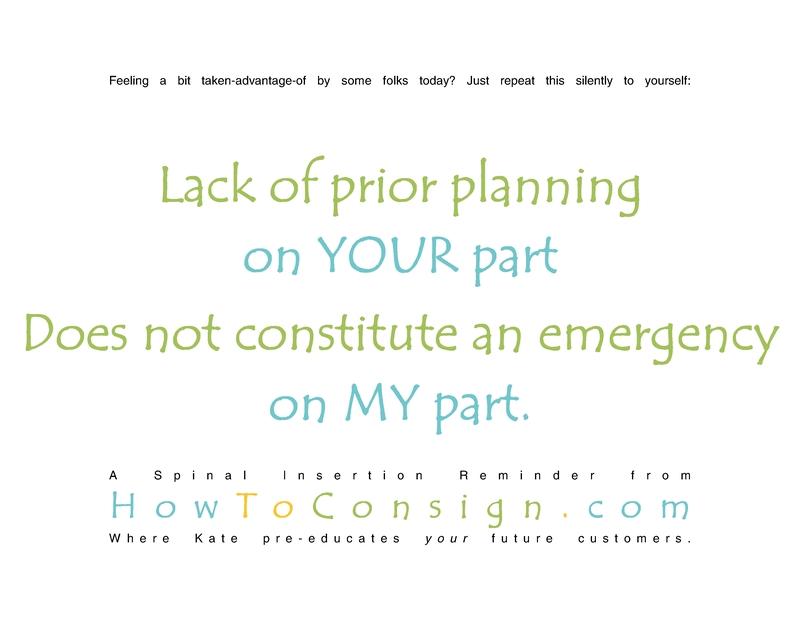 Create your own sign, or click on this graphic, save it to your files, and simply print it out. There, now don’t you feel better already? Gone the guilt feelings that others try to place upon you. No more resenting the “needy” person who believes that the universe, AKA you, exists to serve her. One of the most common areas shopkeepers need to get some spine in is saying “no thank you” to items offered by suppliers that will not make anyone any money. One of our Store Signs Layouts can solve that problem for you lickety-split. It tells folks that it’s not YOU that “doesn’t like” her items, it’s your marketplace. Of course, it’s worded much more simply. Go ahead, make your life simpler. Order the Store Signs today. Great thought! I have gained more gumption in the 4.5 years I’ve been running my business than in my entire 35 years before that:) I finally figured out that some people will take advantage of me endlessly if I allow them to. It still happens sometimes, but I have realized that being “nice” doesn’t always mean they are going to get their way. OMG! I love this. Being a bridal and formal wear store I get this all the time. Especially when it comes to alterations. Bridesmaids who haven’t got their dresses hemmed days before the wedding, etc, etc. Yes, isn’t it amazing how we LET people make us feel guilty for running a business? What problems do resale shops solve? Need some inspiration? Listen to your customers!